This photo is of a 29 year old QH gelding. He was having trouble chewing and was loosing weight. That is one of the largest cheek ulcers I have seen. And the fractured tooth had to be painful as well. We removed the loose part of the fractured tooth and smoothed-off the sharp enamel points. This guy will be able to chew much better and start gaining weight in a month or so. These photos are of an 11 year old Arabian cross gelding. As you can see, he has a very large hook on the first upper left cheek tooth. It is so large that it contacts his lower jaw when he closes his mouth. This due to a conformation issue in which the upper rows of cheek teeth are positioned slightly more forward than the lower cheek teeth. As a result, part of the first upper and last lower cheek teeth do not have opposite tooth to wear against and hooks gradually form. In the “After” photo you can see the hook was removed and he will feel much better now! 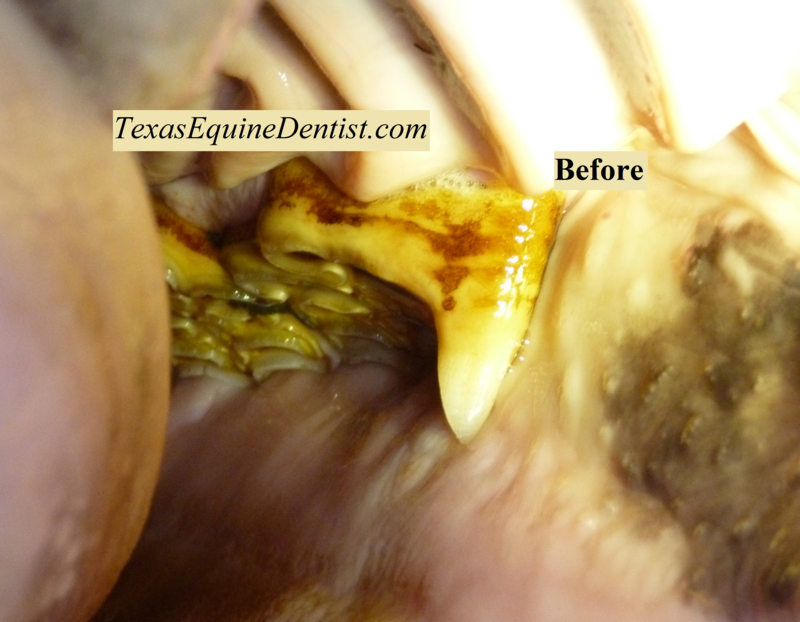 This photo is of a 25 year old gelding that was having difficulty chewing his feed. You can see that he has a number of dental issues but the most obvious is a deep laceration in his cheek caused by a sharp enamel point. 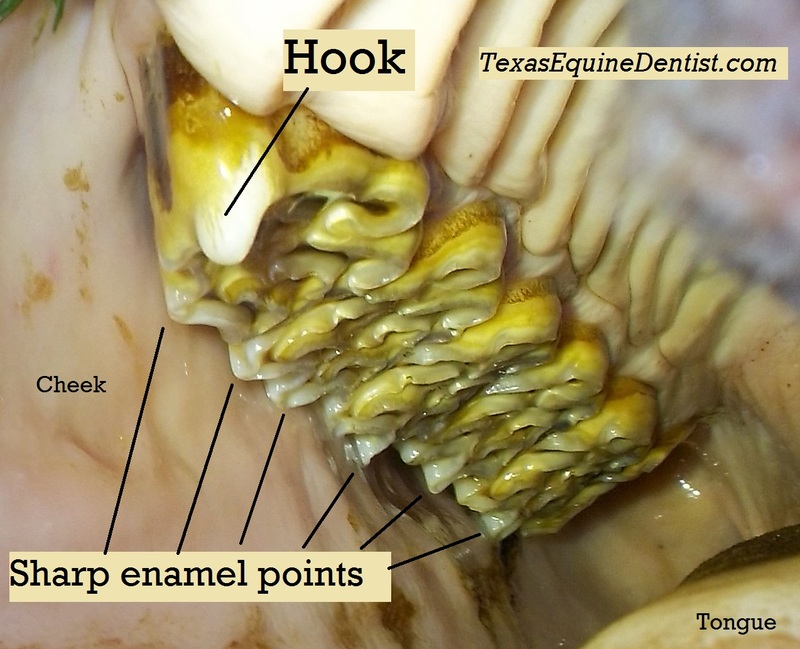 Also, many of the cheek teeth are wore to the gum line making it difficult to chew hay and other coarse feeds. And there were some fragmented molars that required extraction. You just never know what you will find until you look!! Interesting Case: Retained baby incisors. 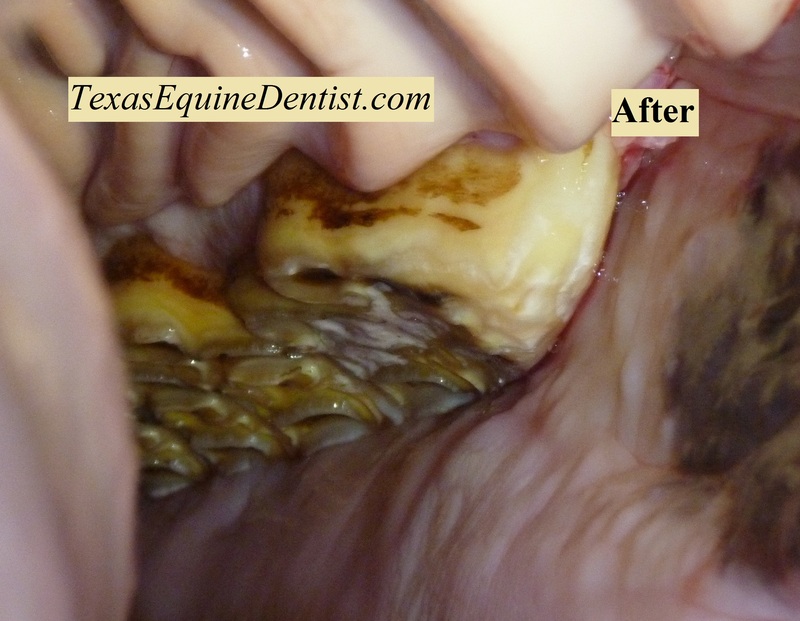 This photo is of a 6 year old Quarter Horse gelding that has 4 retained baby incisors. As the adult incisors erupted, they were “pushed back” by the retained baby teeth and are now out of alignment. The baby teeth should have been completely shed by 4.5 years of age to allow the adult teeth to grow into their proper locations. Treatment of this condition is to extract the retained baby teeth and if they are removed early enough, the adults will erupt normally. In this case, since the horse’s adult incisors are fully matured, there will be some degree of misalignment for the rest of his life. More frequent dental procedures will be needed to maintain normal function. Between the ages of 2.5 – 4.5 years, 24 baby teeth are shed and replaced by 24 adult teeth. These are also the ages that we are training our horses and expect them to perform at futurities, etc. Retained baby teeth can cause discomfort both while eating and when a bit is in their mouth. 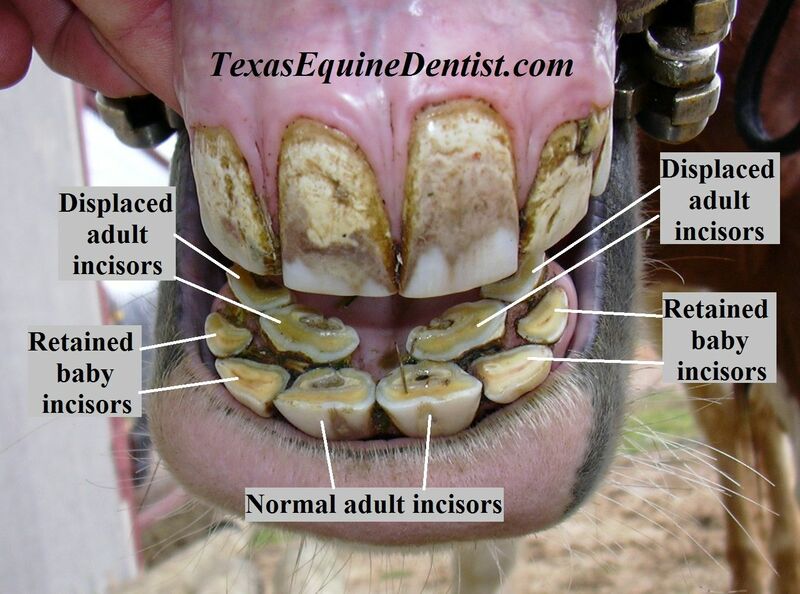 Dental exams should be performed every 6 months in younger horses to address abnormalities that can affect chewing, performance, and dental conformation. Miniature horses, donkeys, and mules seem to have more problems with their teeth than standard breeds of horses. They have the same size and number of teeth as large breeds. All those regular size teeth “crowded” into a compact size head make minis more susceptible to retained baby teeth, malocclusion, and periodontal disease. Miniatures are also more prone to congenital dental problems such as parrot mouth and under bites. Dentistry in these little guys can be challenging at times. Since there is less space to work in the back of their mouth, special tools are necessary to reach their back cheek teeth. 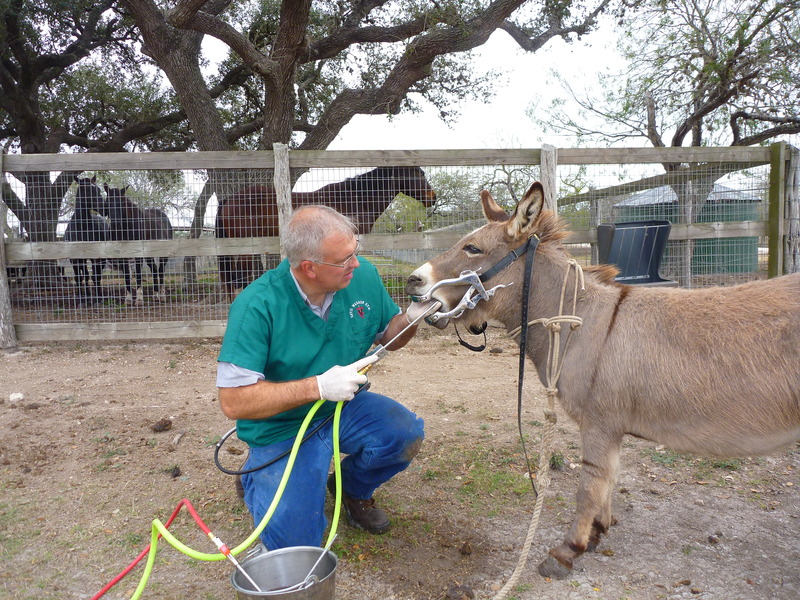 In the photo above I am using a small, thin oscillating dental rasp that is ideal for hard to reach teeth in this mini donkeys’ mouth. So don’t overlook your miniature friends when the time for dental maintenance rolls around. 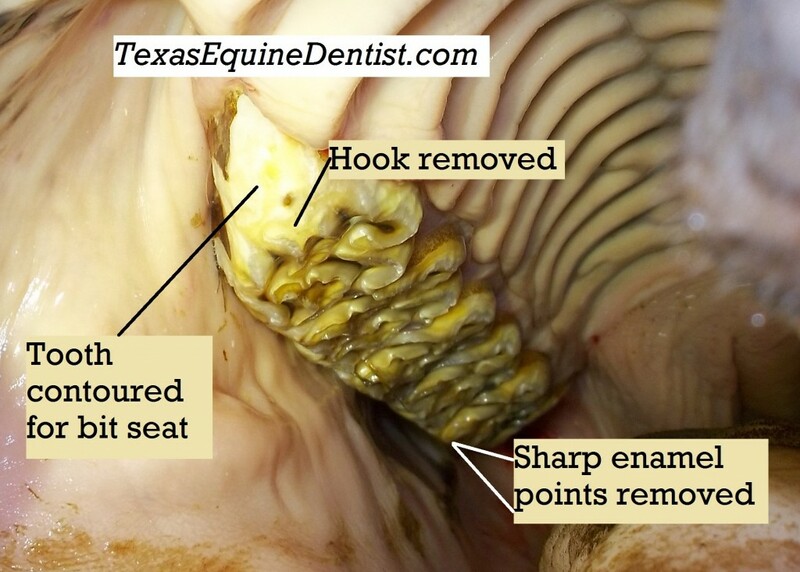 Ulcerations and abrasions of the cheek are commonly found in healthy horses of all ages. These lesions range from small shallow superficial “scrapes” on the surface of the cheek to deep ulcers that become infected. 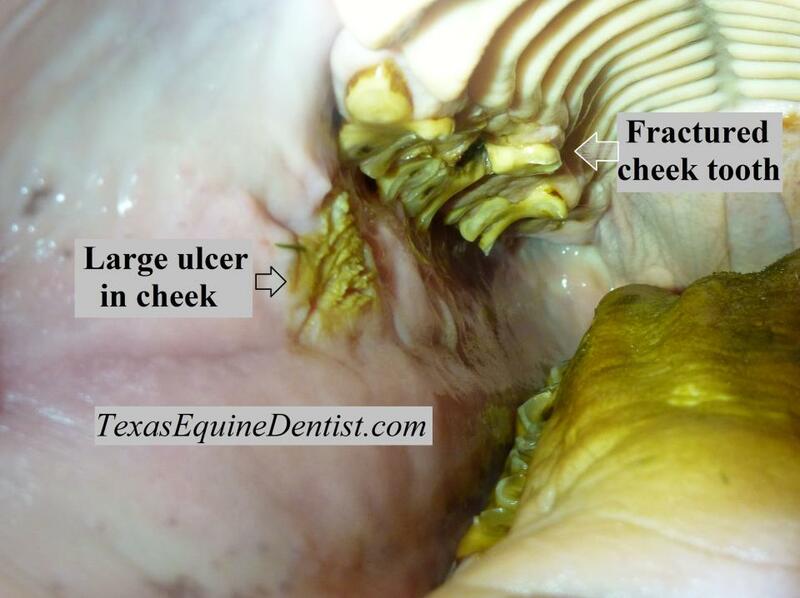 The presence these ulcers result in a variety of symptoms including improper mastication, oral infections, and decreased athletic performance. 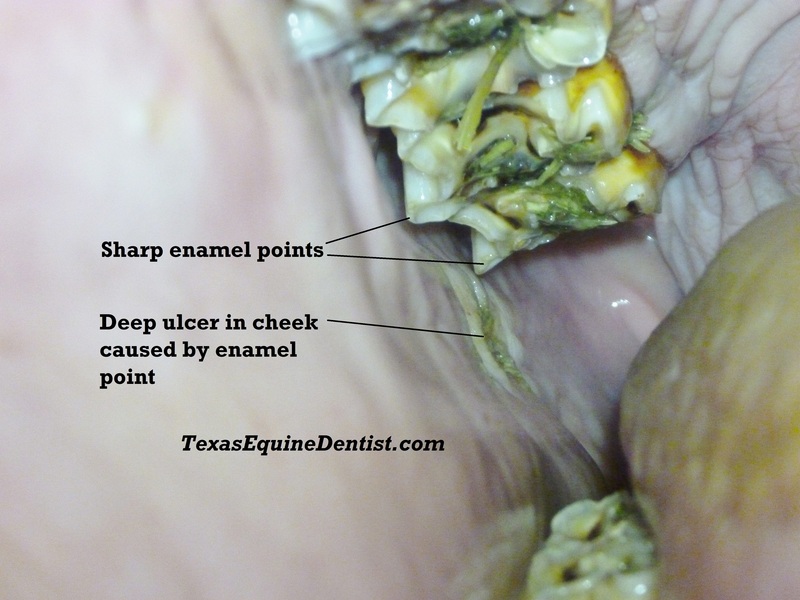 Cheek ulcerations are found in all ages and breeds of horses but are more common in horses less than 10 years of age. Sharp enamel points on the cheek teeth are the culprit. These points are located on the outside (cheek side) surface of the upper cheek teeth and the inside (tongue side) of the lower cheek teeth. They vary in size from small points only a few millimeters in length to larger hook like structures that are capable of digging into surrounding soft tissues. The sharp enamel points in the above photo are average in size. They are located on the last two upper cheek teeth and are very sharp. An ulcer has formed due to one of the enamel points cutting into the cheek during the chewing process. Once the enamel point is removed during the dental float, the ulcer will heal in 5-7 days. This is a photo of a 29 year old roping horse having difficulty chewing and was losing weight. The large deep ulcer in the cheek is due to the long enamel point on the first cheek tooth. There is another quarter size ulcer in the back top part of the mouth near the soft palate. These ulcers are very painful, making it difficult to chew grass and hay. 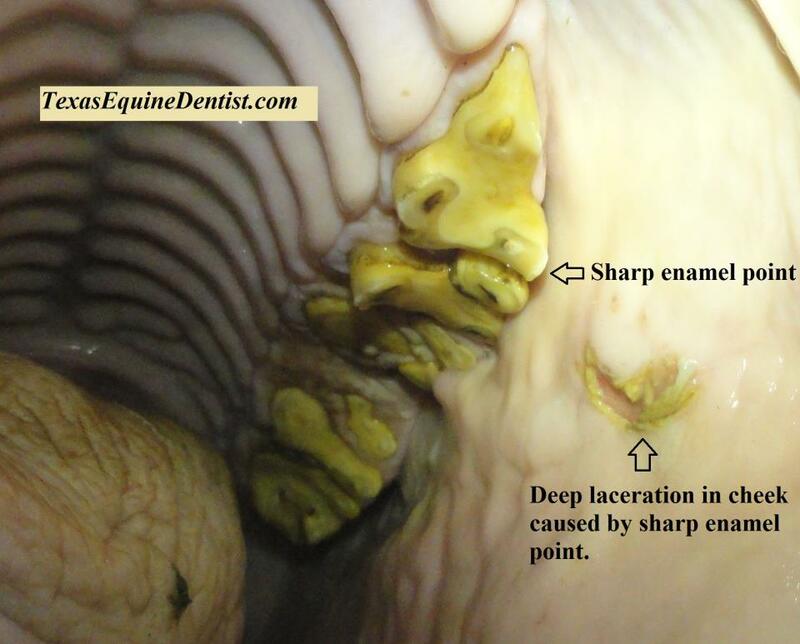 The primary goal of equine dentistry is to reduce pain – pain that interferes with mastication and performance. As you can see, ulceration of the cheeks and surrounding soft tissue must be addressed during dental floating and equilibration. 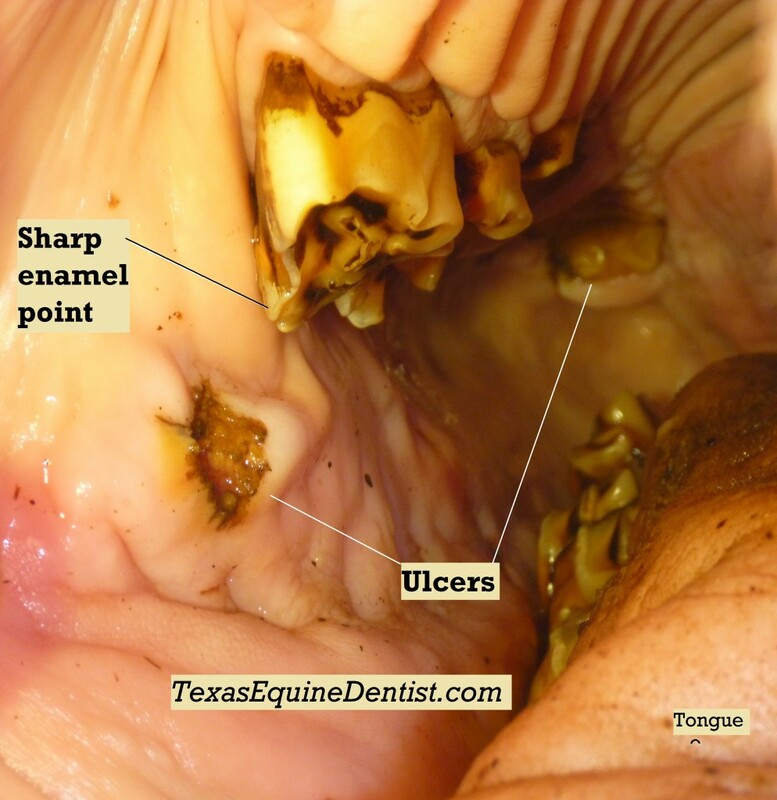 The good news is that once the enamel points are removed, these ulcers will heal and the source of pain resolved. Before and after photos of a 7yr old barrel horse. This horse was resisting the bit and slinging his head. Removing the hooks and sharp enamel points reduced the tension in his head and neck, allowing him make the turns much more freely. Click on the photos for larger images..